Great are the achievements of faith! In the fountain of flame, as in refreshing water, the holy martyr Theodore rejoiced; for, wholly consumed by the fire, he was offered as sweet bread unto the Trinity. By his prayers, O Christ God, save Thou our souls! ➢ We are planning on buying a new processional Cross for Pascha this year. If you would like to contribute towards it, please specify so on your donation. We are over halfway there! You can now donate and tithe electronically on our website! A small fee applies, but is a convenient and secure alternative. Akathist to the Mother of God, “Nurturer of Children” next Sunday before Liturgy. Please sign up for house blessings, if you have not already done so. The Paschal season of the Church is preceded by the season of Great Lent, which is also preceded by its own liturgical preparation. The first sign of the approach of Great Lent comes five Sundays before its beginning. On this Sunday the Gospel reading is about Zacchaeus the tax-collector. It tells how Christ brought salvation to the sinful man, and how his life was changed simply because he “sought to see who Jesus was” (Luke 19:3). The desire and effort to see Jesus begins the entire movement through Lent towards Pascha. It is the first movement of salvation. Our Lenten journey begins with a recognition of our own sinfulness, just as Zacchaeus recognized his. He promised to make restitution by giving half of his wealth to the poor, and by paying to those he had falsely accused four times as much as they had lost. In this, he went beyond the requirements of the Law (Ex. 22:3-12). 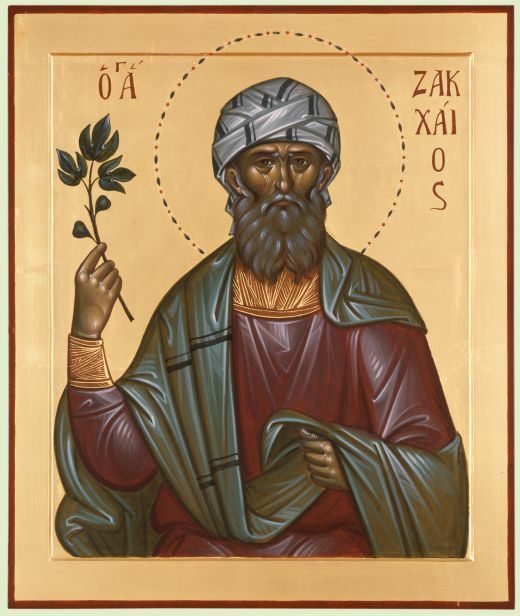 Later on, Zacchaeus followed the Apostle Peter who appointed him bishop of Caesarea in Palestine where he faithfully served the Gospel and died peacefully. The example of Zacchaeus teaches us that we should turn away from our sins, and atone for them. The real proof of our sorrow and repentance is not just a verbal apology, but when we correct ourselves and try to make amends for the consequences of our evil actions. We are assured of God’s mercy and compassion by Christ’s words to Zacchaeus, “Today salvation is come to this house” (Luke 19:9). Zacchaeus was short, so he climbed a tree in order to see the Lord. All of us have sinned and come short of the glory of God (Rom. 3:23). We are also short in our “spiritual stature,” and must therefore climb the ladder of the virtues. In other words, we must prepare for spiritual effort and growth. The Holy Fathers, knowing the weakness of human nature in our attempts to change from sinful, self-centered life to one of humility and repentance, placed this Gospel lesson before us today to instill in us a desire to repent just as Zacchaeus possessed a desire to behold Christ. Having his example before us, let us now prepare ourselves for the approaching struggles of the Great Lent as we set out on our journey to behold Christ’s Life-giving Resurrection.